Think of a city break and one thinks of Paris, Prague or Rome. Point your compass further south and the Tunisian Capital of Tunis comes sharply into focus. A chance to flirt with the continent of Africa is a mere 2.5 hours flying time from the UK, yet seems a world away from the traditional European offering and still within touching distance of Italy. The country’s location has been a focus for civilizations that have left their indelible mark on a country strewn with relics from bygone eras. An overlapping of cultures, religions and history makes Tunis well worth a visit. Tunis is recognizably Mediterranean in character, yet bound together by an Islamic thread and North African climate that hold a seductive charm and mysticism. A century of French colonial rule has created an alluring mix within this part of North Africa. Meandering along Avenue de France, with its’ tree-lined boulevard and pavement café’s set in view of the art deco façade of the Theatre Municipal, one could be forgiven for thinking they were in the South of France. Tunisian men wearing their red Chechiya caps, dark glasses and smoking fruit scented tobacco from their water pipes soon remind you that one has arrived in North Africa. At the far end of the Avenue beyond the Porte de France arch are the winding alleyways of the medina and craft-filled souks leading toward the Ez-Zitoune Mosque at the walled cities core. The medina, much talked and written about, is the heart of the old town. 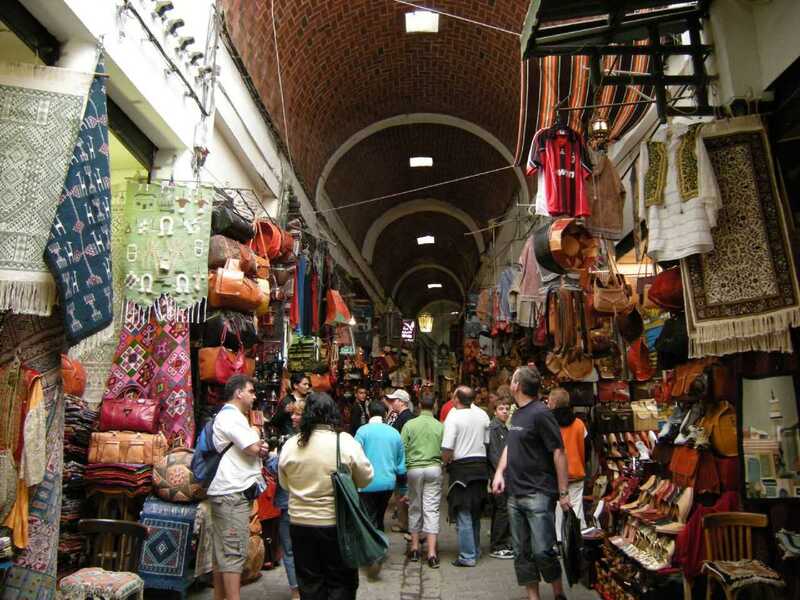 The origins of Tunis grew out from the warren of dark alleyways, markets, palaces and madrasas that along with the Ez-Zitoune Mosque, still remains the focal point of Tunis. And rightly so, as little has changed over the centuries within this UNESCO listed heritage. 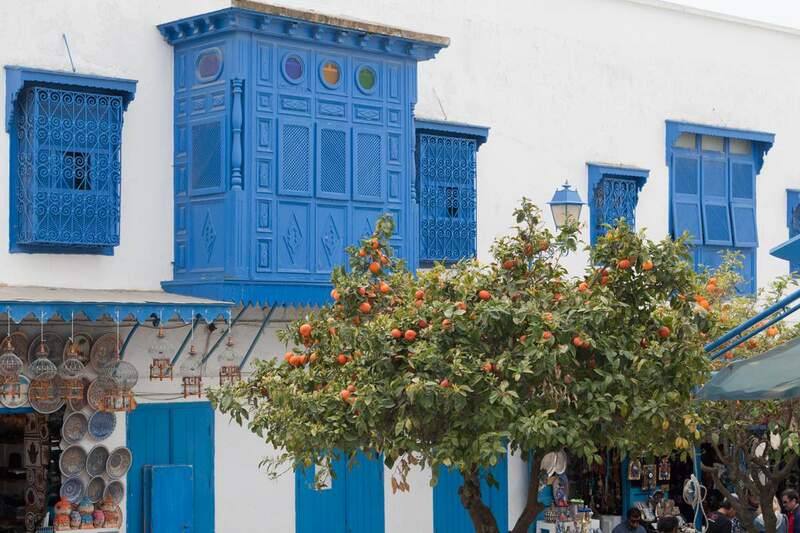 Each twist or turn reveals another surprise; glimpses of tiled courtyards hidden behind weathered wood studded doors or one of the medina’s residences sympathetically transformed into a Dar hotel or romantic restaurant. If you can direct yourself out of the maze of winding paths of the medina, then the Tunis beyond has a diverse range of attractions that step even further back to the origins of Tunisia. The Bardo Museum founded in 1882, has one of the world’s greatest collections of Roman Mosaics and is a great starting point to puzzle together many of the archaeological sites that can be visited across Tunisia. The museum was a former Beylical Palace, whose origins date to the 13th century, and the building alone is a masterpiece of Arabian style architecture with domed ceilings, cupolas and majestic galleries to peer over. From here the fashionable suburbs of Tunis are nearby and provide an elevated and alternative vision of the city. A solitary column stands upon a plinth of stonework, head and shoulders above the rest of the stone masonry, which is strewn across a site that used to be the Antonine Thermal Baths. The granite column topped by a white capital was one of eight such columns used to support the vaulted roof of the Frigidarium (cool pool). 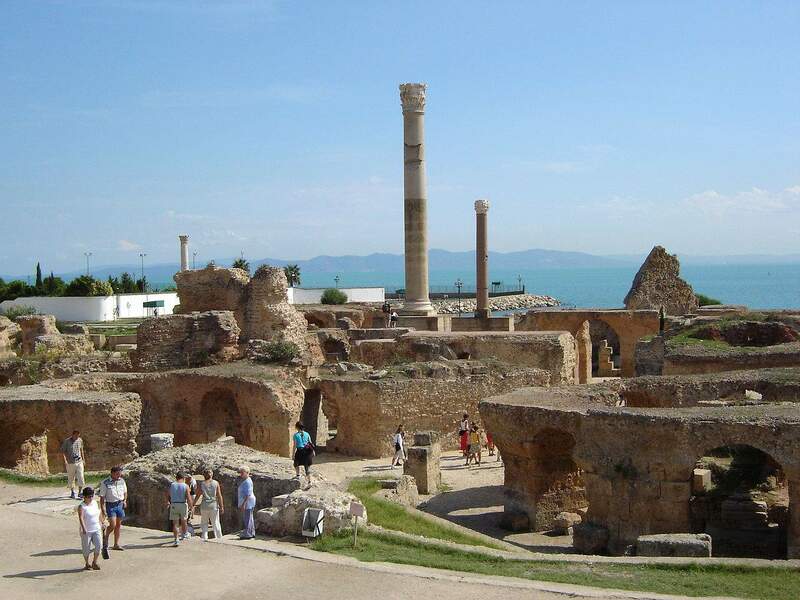 This historical site is part of the city’s Punic-Roman legacy dating back to 814BC in a suburb of Tunis called Carthage. Very few Punic remnants remain, giving a compelling insight into the great tussles for power between the Roman Empire and Carthaginians. The site once coveted by the Phoenicians & Romans is now overlooked by the Presidential Palace of Zine El Abidine Ben Ali and close to the Roman amphitheatre used to this day for concerts. Beyond the Presidential Palace further up the hill is the village of Sidi Bou Said, the Monmatre of North Africa, perched high above the city with a bohemian style and artistic soul. The white washed walls and signature blue studded doors resting under arabesque arches, are depicted on canvas within the many local galleries. Alongside Carthage are the chic resorts of Gammarth and La Marsa that boast some of the best fish restaurants in the city and views over the gulf of Tunis. Phoenician, Roman, Arab, Turkish, French, and the native Berber people have all helped define the Tunis of today. The capital is not a dramatic culture shock for visitors, but just enough to feel you have stepped outside of Europe. Whilst many aspects of life is alien exotic and exciting, the French influence in language, architecture and society makes it easy for weekenders to assimilate quickly with the culture. Tunis has a very relaxed and open feel to it, almost unkempt in a refreshing and charming sense making a weekend date with this part of North Africa almost inevitable. In the heart of the Medina and hidden behind an unassuming entrance is Dar El Medina, an elegantly appointed boutique hotel. Set around an inner courtyard, the rooms of this former residence are nicely furnished with period features and furnishings, reminders of its’ former life. Tunisair operates four flights a week to Tunis from London Heathrow on Friday, Saturday and Sunday. British Airways offers five flights a week to Tunis departing from London Gatwick except Thursdays and Saturdays. A newly opened craft gallery complex Maison Des Artisans, showcasing traditional arts and crafts of Tunisia, from metal work to intricate mosaic creations. Best of all visitors are allowed into the workshops to understand how the products are made. Hammamet, the “Tunisian Saint Tropez”, and sister resort of Yasmine Hammamet is the place to come to experience long sandy beaches and admire the yachts in the new state-of-the-art marina. Enjoy a traditional meal at Dar Bel Hadj restaurant, the former 17th century mansion within the medina, is both a historical and sophisticated venue to enjoy Tunisian cuisine. Follow the Roman Road from Carthage west and visit the amazing Roman Ruins of Bulla Regia and Dougga.